March 25, 1931 -- Golfers in Chicago get a new course to play as the new Lincoln Park golf course, begun the preceding April, opens for play. Beginning in 1929 the city trucked in tons of soil, dumping it in the lake to create 71 acres and a new nine-hole golf course. The original intent was to create an 18-hole course, but a lack of funding led to scaling back the project. Two million dollars later, Waveband Golf Course ran from Diversey Boulevard on the south to Montrose Harbor on the north. In 1991 it was renamed for a former commissioner of the the Park District Board, Sydney Marovitz. Note: Most sources list the official opening of the course as June 15, 1932. 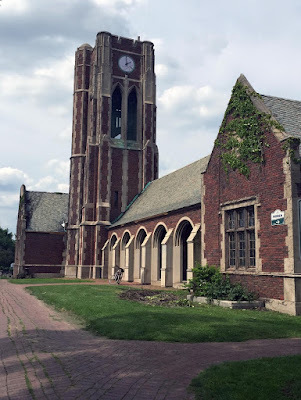 That was the date on which the English Gothic style clubhouse and clock tower, designed by Edwin H. Clark, pictured above, were dedicated. March 29, 2013 -- RiverWalk Loan is a "Done Deal"